PAUL Hawke appeared to have the football world at his feet when he was runner-up to Gavin Brown – by a solitary vote – in the 1989 Copeland Trophy. Wearing a bow-tie and a beaming smile on the night of the count, the one-time Sydney ruck-rover had reeled off the most consistent season of his career, and looked to have guaranteed himself a long and successful career in black and white. The fact he had polled so well, despite playing three fewer games than Brown, validated how good his season had been. Just as telling was the fact the 25-year-old polled a club-high 14 votes in the 1989 Brownlow Medal, only eight behind the winner, Geelong’s Paul Couch. Only Couch, John Platten, Tim Watson, Jason Dunstall, Nicky Winmar and Greg Williams – all genuine stars of the game – won more votes than Hawke that season. Incredibly, he never played another senior game for Collingwood. Hawke’s rise to elite company at Collingwood and his Copeland near-miss followed by his swift return to earth the next season remains one of the great mysteries of the Leigh Matthews era. He was a strong player in his first season at Victoria Park (1988), transformed into one of the game’s best players a year later (1989) and then inexplicably was unable to crack it for even one senior AFL game the season after that (1990). Bad timing – not for the first time in his career – counted against him. His moment in the Magpie sun faded when he fell out of favour with the coach. Tellingly, other players recruited to the club, and the maturation of younger teammates, meant his chances dried up at the most inopportune time. Th result was that this hard-working player is one of the least remembered hard-luck stories of those who missed out on the 1990 premiership success. Ron McKeown (omitted after the qualifying final replay) and Alan Richardson (injured in the second semi-final) deserve more sympathy, but Hawke was still listed as one of the club’s emergencies leading into the Grand Final, despite having not played a game that season. Hawke was a native of Wagga, in New South Wales. As a youngster, he coaxed a young cricketer and soccer player to also take up the game of Australian football when he was about 11. The kid’s name was Mark Taylor, and he would later find fame as one of Australia’s most successful cricket captains. However, he made his mark in 72 games across four seasons (1984-1987), averaging a goal per game for the Swans, alternating between the forward line and changing ruck-rover with Healy. “With Gerard Healy there, I didn’t just have the best ruck-rover in the team to change with, but the best ruck-rover in Australia. I suppose there weren’t that many chances,” Hawke said, explaining why he sought greater opportunities at Collingwood and left the Swans after the 1987 season on a $75,000 transfer fee. At his first training session for the Magpies, at La Trobe University sports ovals, Hawke was still in the process of moving house and had a television and a video recorder in the back seat of his car. By the time he returned to his car, his electronic equipment had been stolen and he had to use his first black and white pay cheque to buy replacements. On the field, it was a better start. 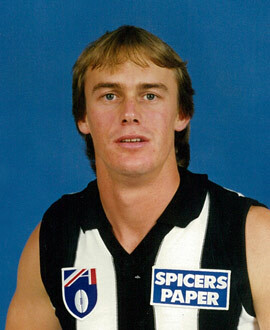 He played in the first match of 1988 – after representing New South Wales in the Bicentennial Carnival – kicking two goals in the Magpies’ win over the Brisbane Bears, and he had 20 or more disposals in his first eight games with the Magpies. Hawke played 19 games in 1989, having almost 500 disposals for the season, including a career-high 41 disposals in a Round 12 game against Richmond. Frustratingly, the next time the Magpies played the Tigers, in Round 21, he suffered a hamstring injury, which cost him a spot in the club’s elimination final loss to Melbourne a few weeks later. It may also have cost him a Copeland Trophy, given he missed the last round. He never played a senior game for Collingwood after that, as he first battled against injury, and then was overlooked later in the season as the Magpies went on to win the 1990 premiership. Hawke, though, remained confident he could win his way back into the team, but a phone call from football manager Graeme Allan just before the start of the ’91 season – after he had played a few practice matches – revealed his services were no longer required. Hawke’s original club granted him a reprieve in 1991, but he could manage only one more AFL game – for a total of 114 – before also being delisted by the Swans. His abbreviated AFL career was over at 27, only two years after he almost won a best-and-fairest, and after he upstaged more than a few higher profile players on Brownlow Medal night.